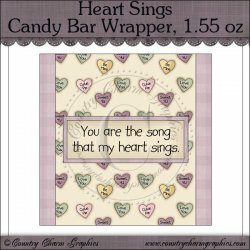 We hope you enjoy this Free Valentine's Day Candy Bar Wrapper that covers a 1.55 oz Hershey's Bar. Â©Original Artwork by Cheryl Seslar. Â©Original Printable/Template by Country Charm Graphics. All freebies are for personal use only. You may not sell them or claim them as your own. Please do not share them or give them away to online groups, lists or forums. Kindly direct your friends to this link so that they can download their own copy of the freebie of their choice. Crafters, you are welcome to use these freebies to create handmade goodies for craft shows, bake sales, school sales, fairs, etc. No crafter's license is necessary. If selling online, it would be lovely if you would provide a credit link to Country Charm Graphics but it is not required. We would love to see pictures of what you create! Love Bears All Candy Bar Wrapper 1.55 oz.